Today’s Fuel Prices: New Lower Prices! We offer rock-bottom fuel pricing in the Merritt Island Port Canaveral area. Always the lowest prices on the water. Remember, docking/storage customers of Harbortown Marina receive 10 cents off per gallon on Gas or Diesel fuel. Be sure to sign up for our Harbortown Rewards E-mail Club to receive an instant coupon for an extra 5 cents off per gallon, plus future news and updates from the marina. The email list sign-up form is located on the right side bar of this webpage or below this post on your mobile phone. Checking Gas Prices From Your Boat? There’s An APP For That! Would you like to check gas prices easier on-the-go from your mobile phone? Download our NEW Harbortown Marina App. Now available in the App Store for Apple and Android. 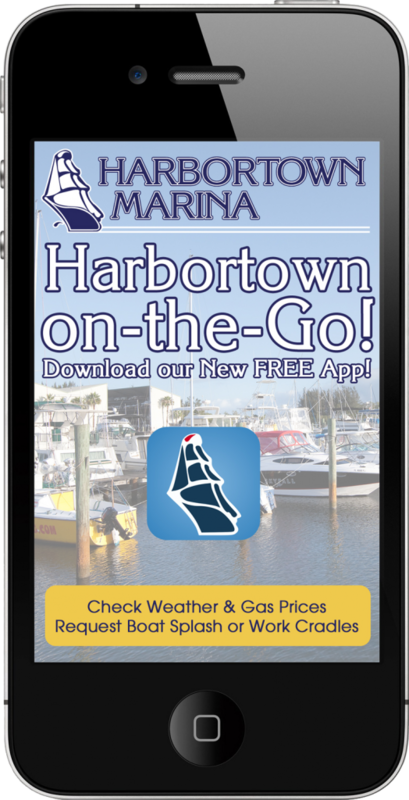 With the new Harbortown Marina app, you can check gas prices, marine forecasts (at Harbortown or you location), get announcements from the marina, and if you store your boat at Harbortown, you can even request a splash or work cradle from the app! Download your app today.